Removable lithium-ion 18650 batteries are the most common way to charge most vape mods. While there are mods that take other battery sizes such as 26650 and some that have an internal battery, if you’re serious about vaping you’ll come across 18650 batteries sooner or later. The best 18650 battery for vaping is the LG HG2 3000mAh. There has been a huge growth in the number of 18650 batteries available in the market. Different battery brands have been trying to outdo each other in order to attract more customers. With numerous batteries to choose from, the search for the ultimate 18650 battery can be a challenge. Which is why we have compiled this list of the best 18650 batteries available right now. It will give you an idea on which ones offer the best features. Hopefully, this list can help make your choice easier. The LG HG2 is considered one of the “go-to” batteries for new vapers who aren’t entirely sure what they’re looking for. It provides an excellent combination of current rating, capacity, voltage, and operating temperature. 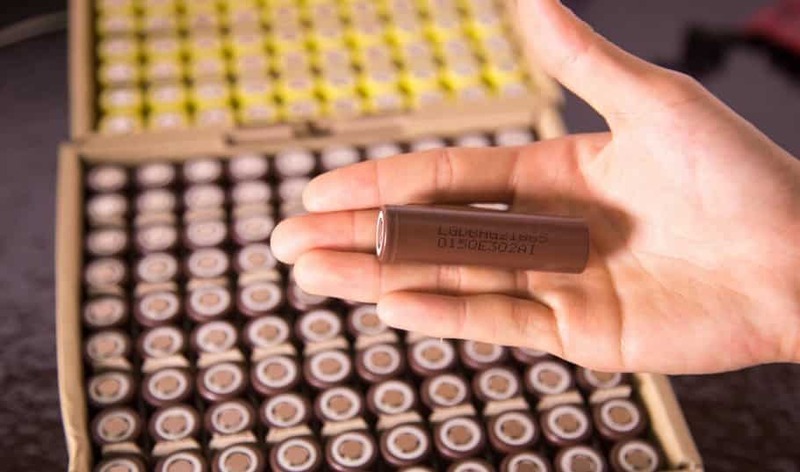 This battery is essentially the jack-of-all-trades in the 18650 battery world. While it’s not completely outstanding in any one aspect, it has decent all-around performance specs. If there isn’t something in particular that you’re looking for, you should definitely buy this one. Click Here For an Exclusive Deal on LG. The Samsung 25R is another all-around excellent 18650 battery. It runs a little bit cooler than the LG HG2, but still provides a well-balanced combination of capacity, voltage, and current rating. If you want a great overall battery from a reputable manufacturer, the Samsung 25R is the right choice for you. Click Here For an Exclusive Deal on Samsung. This one is super-cool because it manages to have a high current rating, but also operates at a medium temperature with a decent voltage rating. The VTC4 is capable of firing up to 30A, so you’ll be able to push out a decent amount of power using this thing. Click Here For an Exclusive Deal on Sony. The LG HE4 is a 35A-capable 18650 battery that has earned a spot on our best-of list. Similar to the Sony VTC4, the HE4 provides a solid current rating and operates at a medium temperature. If you’re looking for something in the 30A range, you can’t go wrong with the LG HE4. Next articleHow Often Should You Change Your Vape Wick?